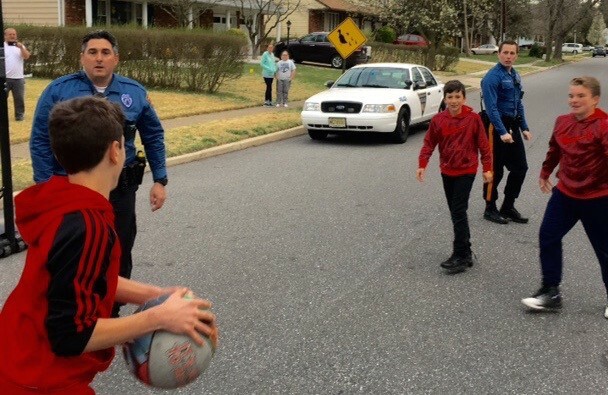 Officers joined in on a game of basketball with local youth, an example of the department’s community caretaking philosophy. Photo submitted by Washington Township Police Department. Alongside law enforcement, community members should expect to see police officers out of their cars and interacting with residents as a result of Chief of Police Patrick Gurcsik’s newly implemented outreach philosophy called community caretaking. Seeking to change the culture of policing, Gurcsik hopes community caretaking will build relationships through non-enforcement interaction and, in turn, open lines of communication and trust between residents and the department. According to Gurcsik, the idea came from looking at different types of policing used throughout the country and finding a large emphasis on community engagement. A major influence on the principles of community caretaking came from a 2015 report created by experts and former President Obama’s task force. The report called for law enforcement agencies to be guardians and less stat-driven enforcers, to embrace communities, build community trust and legitimacy from positive police interaction, provide fair and impartial policing, and to utilize technology, Gurcsik said. The philosophy emphasizes service, partnerships, crime prevention and proactive services. Officers’ monthly evaluations will now factor in their daily community involvement along with their enforcement statistics. Gurcsik said he is looking to invite residents into the police department with open houses, is scheduling a citizen’s police academy and junior police academy, plans to hold additional Coffee with a Cop events and K-9 demonstrations and has asked officers to perform school walk-throughs. Officers are also encouraged to get out of their patrol cars and engage with community members during their shifts. “They should know that police are here to help them, and they are approachable and friends,” Gurcsik said. Some upcoming community events the police department will be involved with include the Fourth of July parade with a K-9 float, Super Saturday on May 13 providing a demonstration, department t-shirts and collectible trading cards, and National Night Out on Aug. 1, a crime and drug prevention event sponsored by the National Association of Town Watch.